A top-of-the-range version of one of the world’s best-selling entrance mats, Waterhog™ Premier, has been released in Australia by the General Mat Company (GMC). Waterhog Premier features a rubber-reinforced face design for added beauty and performance, in addition to the Waterhog range’s unique ribbed construction that is designed to soak up dirt and water before it can spoil expensive carpets or flooring and create safety hazards. Waterhog Premier™ No. 295 is designed to remain functional and attractive while removing and trapping dirt and moisture, holding up to 6.79 litres of water per square metre. 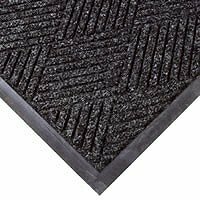 Its rubber face design is complemented by a 36-ounce heavy duty multi-denier yarn system that is 33 per cent heavier than the original Waterhog range made by the Andersen company, which is one of the world’s leading producers of heavy duty entrance matting. The dual fibre construction combines thick fibres for scraping, with thin fibres for wiping, providing better mat performance and longer life, says GMC Managing Director Mr Michael Siegle. Like the original Waterhog, the Premier range’s rubber-reinforced face prevents crushing under the highest traffic areas. Also like the original, Waterhog Premier features a water dam around the border which traps dirt and water, keeping them off carpets and floors and minimising slip hazards and floor damage around the perimeter of the mat. "Waterhog is one of the most successful entrance matting products in the world because of its efficiency in keeping dirt out of buildings . It has been estimated that once dirt is allowed into a building, it costs roughly $1000 a kilogram to remove," said Mr Siegle, whose company holds exclusive distribution rights for Andersen products in Australia. Colourfast and lightfast Waterhog matting - constructed from solution-dyed polypropylene textile on a rubber backing - is intended for use in commercial and industrial buildings, including factories, hospitals, hotels, shops, offices, transport terminals and public amenities. Colours include Indigo, Southern Pine and Black Smoke. Rubber reinforced face nubs and waffle design, which together prevent the pile from crushing, extending product life. Quick-drying polypropylene fibre which will not fade or rot. Mats can easily be vacuumed or hosed off. High anti-static ratings, averaging 1.2kv. Waterhog Premier mats have a maximum average voltage of 1.6kv as measured by the AATCC and meet IBM’s minimum standard for electrical resistance. This means they are safe for use in computer rooms and around electrical equipment. Waterhog passes flammability standard DOCFFQ70 (but is not recommended for use in areas exposed to grease or petroleum products). In addition to distributing Waterhog, The General Mat Company is Australia’s largest supplier of anti-fatigue, ergonomic and safety matting.